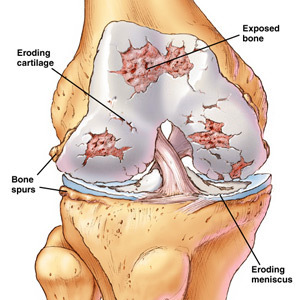 A new research study appearing in the Journal of Bone and Joint Surgery, supports bariatric surgery in morbidly obese patients with end-stage osteoarthritis (loss of cartilage and joint pain, caused by aging and use) prior to Total Knee Replacement Surgery TKR. A large number of patients who need Knee Replacement Surgery are obese (a body mass index (BMI) > 30 kg/m2) and obesity is a known risk factor for osteoarthritis. While TKR is a typical treatment for end-stage osteoarthritis, obesity places patients at an increased risk for complications, including delayed wound healing, infection, the need for revision surgery, and lower functional outcomes. During the evaluation, researchers used a computer model to analyze previously published data on obesity, bariatric surgery and TKR. The evaluation compared the costs and outcomes of two treatment options for patients with morbid obesity (a BMI ?35 kg/m2) and end-stage knee osteoarthritis: The first, TKR without prior weight loss; and the second, TKR two years after bariatric surgery. The model predicts that patients with morbid obesity who undergo bariatric surgery two years prior to TKR are more likely to enjoy improved quality-of-life, measured in quality-adjusted life years (QALYs), than patients undergoing TKR without prior weight loss surgery.